There is still so much to do to reduce violence against women. Together, let’s take action! 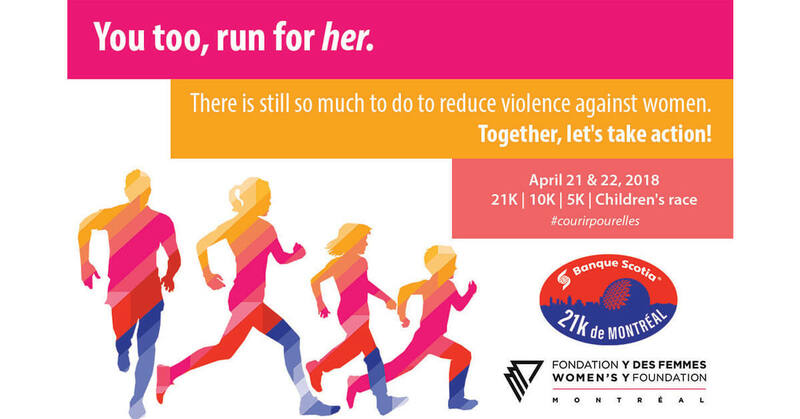 The Scotiabank 21k, 10k and 5k Montreal Charity Challenge will take place on Saturday, April 21st and Sunday, April 22nd, 2018 at Parc Jean-Drapeau in Montreal. For a nineteenth participation, the Foundation hopes to bring together more than fifty participants and raise $ 25,000. We invite walkers and runners of all levels to participate in this challenge to raise awareness and raise money for our cause. All proceeds will go towards funding the programs and services of YWCA Montreal. This year… let’s run together so that they can move forward!! Every dollar raised and every step taken towards the finish line can make a difference in the life of a woman or a girl. Run for your mother, run for your daughter, run for your friend… run for a woman who is dear to you. Hurry up, space is limited. Any questions? Contact Sonia Wong at 514 866-9944 or visit the Scotia Bank Challenge Website. All violence against women is an adversity that is still very present in our society. Charity organization with the highest average funds raised per runner. The Banque Scotia 21k de Montreal et 5k event hosts an international calibre half-marathon. The Scotiabank Charity Challenge has helped raises millions of dollars each year to support more than 500 charities across Canada. Since its inception, the Scotiabank Charity Challenge has raised more than $ 50 million for philanthropic causes, including more than $ 7.3 million in 2014 alone, in order to provide a better future for youth, while helping to build. strong and vibrant communities.